Last May I was lucky enough to travel to Florence for three glorious weeks. Well, the first two were glorious, then my little girl got bronchitis and an ear infection and suddenly a really cool trip turned a little bit worrisome, the language barrier grew dramatically then. Still, we weathered the storm and learn a lot about Italian way of life, the rhythm and little cultural things. I also stayed in an apartment off of the AirBnB website. That was lovely. We had a rather sizeable two bedroom apartment just across the street from the Coop, a big grocery store; several restaurants; a panifico, a bread store; a gelateria, ice cream; a park; a farmacia, pharmacy, and of course several café’s. And the apartment, while centrally located, was very quiet. *Said slowly with a sultry Italian roll of the ‘r’ and an elongation of the ‘ll’s’. Were still talking about coffee right? 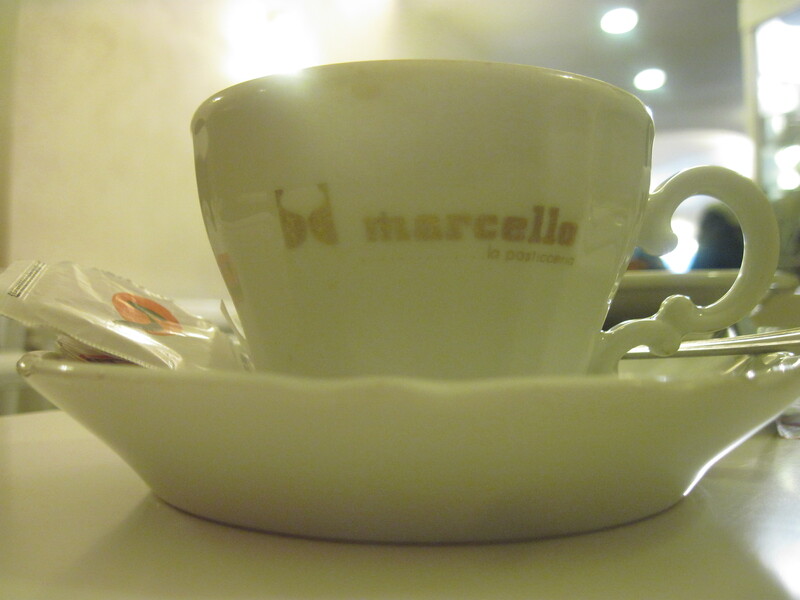 Well, after going to Marcello I am talking about coffee and I am talking about a sigh worthy moment taken out as a nod to the genius behind the pastries and cakes and sandwiches and other assorted deliciousness at Marcello…la Pasticceria. This is a post from my other blog, The Writing Moose. This entry is also the reason I wanted to start this little blog dedicated to the talking about all things coffee! I liked this blog so much, thought it deserved a run here. The perfect topic for a Saturday morning. The Italian Cafe from about 8 to 10 in the morning is a thing of pure beauty. A well-oiled machine that just begs the foreigner to stand back in awe. People crowd around the pastry case first, no well-formed line, just a general understanding of who might take their turn next. Neighbors greet each other at their friendly neighborhood café on their way to work. In the daily life of the Italian, they have a pastry and a coffee for breakfast; a large lunch and finally a demure dinner. There is no snacking in between, maybe a quick apertivo on the way home from work, stopping by ones local neighborhood café once more. A café that no longer offers breakfast goods, but has transformed into a bar with a spread of sandwiches, cheeses, breads, pappa al pomodoro (a little tomato bread soup) and an espresso (un café) with a shot of liquor in it, or maybe a red wine. I fell in love with the cappuccino when I was visiting my sister in Italy. I loved it because I needed coffee and I had no money and it was only .90c, how is that for a coffee fix. I also loved the ceremony surrounding it. I loved the size of the cups. I loved the clink of the cups against saucers. I loved that everyone stopped by cafes early in the morning, drank their cappuccino in three swigs and then continued on to work or where their day might take them. I wanted to buy the cappuccino cups that I’d seen in every cafe, but no one would sell them to us and we weren’t quite sure where to go to get them.